Come join the San Antonio Chapter of the Saltwater-Fisheries Enhancement Association (SEA) for the Summer Slam Fishing Tournament. 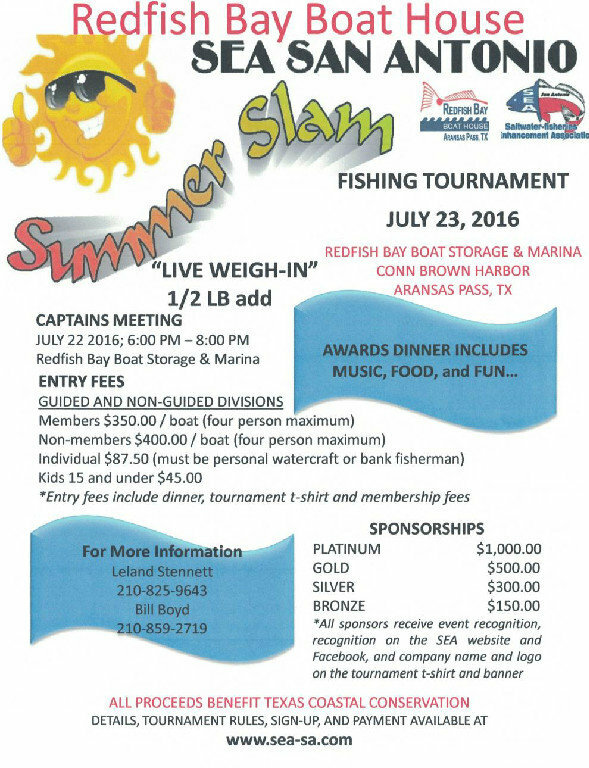 The tournament will be held at the Redfish Bay Boat House in Aransas Pass, TX on July 23, 2016. There are numerous ways to support Texas Coastal Conservation through this event. Entry fees include dinner, a tournament t-shirt, and membership fees. Sponsors will receive event recognition, recognition on the SEA website and social media, and company name and logo on the tournament t-shirt and banner. The tournament will include a “live weigh in” 1/2 LB add and an awards dinner featuring music, food, and fun. Please refer to the entry and sponsorship fees below. There will be a captains meeting on July 22, 2016 from 6-8PM at the Redfish Bay boat storage and marina. For more information please contact Leland Stennett at 201-825-9643 or Bill Boyd at 210-859-2719. For all other details, tournament rules, sign-ups, and payments, please visit SEA-SA.com or refer to the tournament flyer to the right.